This morning we launched Facebook Stories (FacebookStories.com), a new site to celebrate the extraordinary ways that people are using Facebook. Every month we will release new stories in the form of videos, articles, illustrations, playlists, and reading lists centered around a theme. 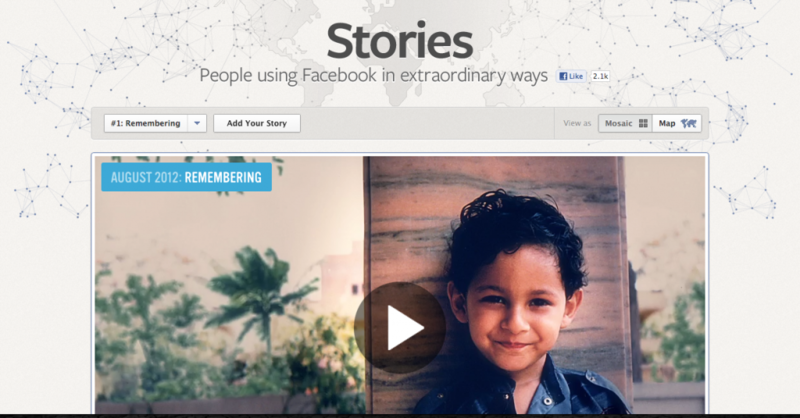 Our first theme is “Remembering.” We invite you to explore the stories at facebookstories.com and to encourage your friends to submit their own. The first shows the story of Mayank Sharma who used Facebook to connect with his old acquaintances after he was diagnosed with Meningitis at the age of 27. His story is about how he rebuilt his life with the help of Facebook after he had lost his memory owing to Meningitis. Similar to Twitter Stories and Tumblr Storyboard, the aim of Facebook Stories is to share the stories of people whom Facebook helped to connect with meaningful people, help leverage community support and face adversities. Every month new issues will be released which will focused on people instead of businesses. The entire website is about connecting with the emotions of people and how Facebook has been a blessing to many a lives. Personally, this is a great move by Facebook. After it had become a mammoth organization it started losing it humane touch. It started looking like a huge machine with no soul. But Facebook Stories will try to change that perception and I hope it does.